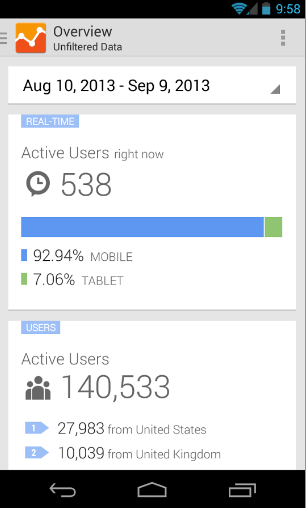 previously launched an Android app for Google Analytics that we’re excited has been downloaded more than 700,000 times to date. We’ve been listening to your feedback and hear you loud and clear: the Google Analytics Android app should do more. 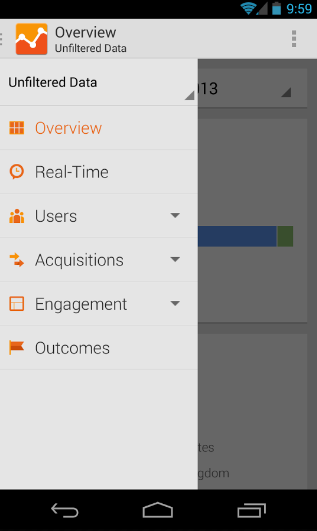 So today we are pleased to announce the launch the latest version of the Google Analytics App for Android devices. Visit Google Play to download and install the app to keep up with your data anytime, anywhere. Like what you see in the new version? Review it in Google Play! We’ve added more reporting tools and enhanced the functionality of this version, so you have a first-class Google Analytics experience on every device. What’s new, specifically? With the Google Analytics App, you can access all of your data - for both web and app reporting views (profiles) - so you can keep track of all of your important data with reports that are optimized for whatever device you’re using, ensuring a beautiful and intuitive experience. We’re also introducing new visualizations designed with tablets and phones in mind. Rather than getting overwhelmed with too much information on a small screen, you now see just the most relevant metrics on cards, so you decide when you want to drill-down for details or just get a quick update on your performance. We built our app using Google Tag Manager for Mobile Apps. As a result, it’s highly configurable and we can add new reports, change navigation, update visualizations all without having to update the app. We’ve made several improvements to the app based on your feedback and have more planned, so please keep it coming. Learn more about how you can make your own apps highly configurable with GTM. At Google, we want to build tools that help you stay connected no matter where you are. Whether you’re in the boardroom, at a live event, or even during a day at the beach: having access to Analytics at your fingertips is important. 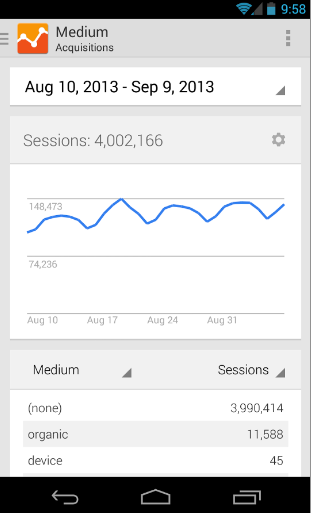 That’s why we previously launched an Android app for Google Analytics that we’re excited has been downloaded more than 700,000 times to date.